Dr William Malcolm Murray Lyon, who recently died in his 95th year, was the last Physician Superintendent of Sunnyside Royal Hospital, Montrose. Appointed in 1964, he retired from the post in 1979. 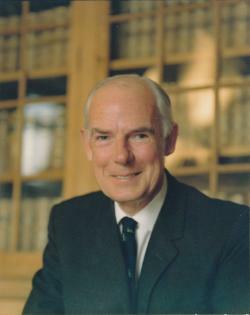 Dr Lyon was born in 1920, the son of the late Professor David Malcolm Murray Lyon FRCP Edin of Edinburgh University and former president of the Royal College of Physicians Edinburgh and Editor of the Edinburgh Medical Journal. Dr W M M Lyon was educated at George Watson’s College and graduated from Edinburgh University. He became a Member of the Royal College of Physicians of Edinburgh in 1948, gained a D.P.M in 1955 and was made FRCP Edin in 1968. After service in the Royal Army Medical Corps in East Africa Command, Dr Lyon returned to the Royal Infirmary, Edinburgh where he met his future wife, Vera. In 1952 he became the Assistant Physician at the Royal Edinburgh Hospital for Mental and Nervous Disorders. The following year he was appointed Deputy Physician Superintendent of the then Dundee Royal Mental Hospital and Assistant Physician at Maryfield Hospital. During this time, Dr Lyon was also a tutor in Clinical Psychiatry at St Andrews University. Five years in Dundee were followed by a career move to Northumberland where he was Consultant Psychiatrist and Deputy Medical Superintendent at St Mary’s Hospital, Stannington near Morpeth. Returning to Scotland in 1964, Dr Lyon’s final position was as Physician Superintendent at Sunnyside Royal Hospital, Montrose. Following retirement he returned to his roots and lived for some 27 years in Colinton, Edinburgh. Throughout this time, he and his wife took the opportunity to travel to the far corners of the world. For many years they enjoyed winter months in Spain where he became a popular figure with the locals. He spent his last 3 years living closer to his family in Lincolnshire. He is survived by his wife Vera, 3 children: David, Rowena, and Patricia; 8 grandchildren and 3 great grandchildren.